I don’t have any recent tournament games, so I decided I’d share a few blitz games I played last September in Montreal. After the Category 16 (2628 FIDE average for me) Montreal International, there was a blitz tournament involving most of the players and some other strong players who were in town. GMs Bacrot, Naiditsch, Onischuk, Moiseenko, and Tiviakov headlined the main event, and all but Bacrot participated in the blitz, which was a swiss with 6 double rounds. This was blitz at 5 minutes apiece, no increment. In the first round, just as in the main event, I was paired with GM Alexander Onischuk (2699 FIDE at the time). I didn’t have much luck in the slow phase of the event, getting thoroughly outplayed as white in a Queen’s Indian. In the first blitz game, though, I had the black pieces. I played my usual Slav and we followed a somewhat theoretical path up until this point. His 15.Kh1 (to reach the above position) was new for me, though, but I think I might have come up with a good response. After 9 rounds, I had 5.0/9 along with a performance rating of around 2660. 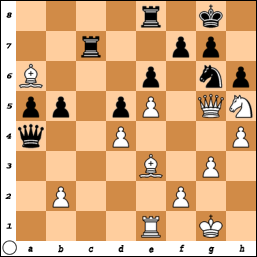 In round 10, I had the white pieces against GM Alexander Moiseenko (2682 FIDE). Moiseenko came in as one of higher seeds, but after his first round loss to Bluvshtein (from what seemed to be a winning position), he had trouble finding his bearings. It took him until the 9th round to score his first win of the event! I managed to get a nice positional advantage. I slowly increased my advantage until he felt he had no choice but to jettison a pawn and hope for chances with some tactics in my mild time pressure. His gamble turned out to be right. I had already given him too much counterplay (I should have played g2-g3 a long time back, kicking the knight away from the strong f4-square), and at this point, I wanted to get my knight on a4 back into the game. Playing back to c3 allows the strong 30…Nxg2! tactical blow, while going to b2 didn’t seem particularly active. Thus, I ended up playing 30.b4?. As it turns out, 30.Nb2 and then 31.Nbc4 is quite alright for White, as Black can’t do much with all of White’s pieces working together. 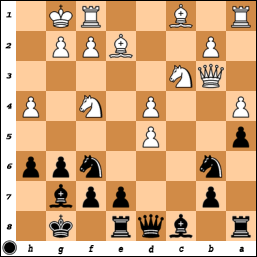 However, after 30.b4?, Black has the tricky 30…Bc4+!. I had missed this, and to compound my error, I played 31.Nxc4 Rxc4 32.Qd8+ Qxd8 33.Rxd8+ Kh7 34.Rd2 Rxb4, when the material count has been equalized, but Black’s pieces are clearly more active than their White counterparts. After a couple more mistakes, I found myself in a lost endgame that he managed to convert. Had I played 31.Kf2 instead, though, I might have survived, as on his planned 31…Be2, White has the strong intermediate move 32.Qd7!. Now Black’s rook either must give up the c-file (and so can’t invade on c2, or take the d-file after something like 32.Rg1 Rd8), or the 8th rank (which allows White a favorable trade of queens). Oh well, after having a strong stretch from rounds 4 to 9, I wasn’t so disappointed with losing to a strong player like Moiseenko. The loss brought me to 50% (5.0/10), and in the last round, I’d be facing the leader, GM Arkadij Naiditsch (2697 FIDE), with the black pieces. I had played Naiditsch twice before (see https://vbhat.wordpress.com/2009/08/24/back-in-the-day/), but obviously, he had become much stronger since those days. He’s almost always a 1.e4 player, but his theoretical preparation seemed to set him apart from most of the competitors in this event – he was often blitzing out his opening moves on his way to a clear advantage, and he won a number of games straight from the opening. He played a Panov-Botvinnik Attack, which was a huge surprise, and although I remembered my old analysis from 2006 or so, I had never bothered to update it and didn’t realize the line had been discarded by Black players. 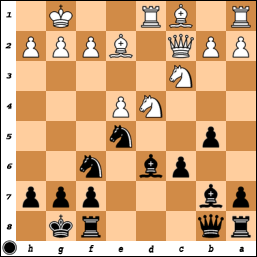 Black’s problem is simple – he’s down a pawn and he has trouble bringing his pieces out. Black’s knight on b6 is a bit loose, and the b5-square is a big hole. Black also can’t really kick the knight from f4, because after …g5, hxg5, the g5-pawn will be too weak and so Black usually won’t even have time to round up the d5-pawn. I tried 13…Bf5 14.Be3 Qd6, with the idea of 15…Rd8, to get that d5-pawn back finally. However, after 15.Nb5, I had to play 15…Qd8. I thought at first that I was getting some counterplay after 16.Rac1 Nfxd5 17.Bf3 Nxe3 18.fxe3 e5, but it turned to be illusory. 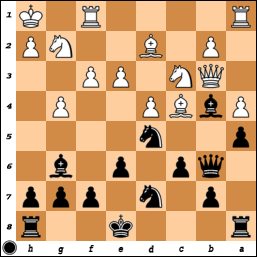 After 19.dxe5 Bxe5 20.h5, Black’s position is falling apart everywhere, while the e3-pawn is not easy to target. I went down in flames in less 10 more moves. Thus, I finished with 2 losses to take me to 5.0/11 (or -1). Overall, the performance was still a positive one, as based on my rating, I was expected to score somewhere around 2.5 or 3.0 out of 11 games! I should say thanks to the organizers (led by André Langlois), who put on an excellent tournament. Thanks also to Richard Berube, who was the TD and the organizer of the qualifying event in June. I enjoyed Montreal and hope to make it back next year. Now I’m off to my next event, the SPICE Cup (Group B) in Lubbock, Texas. It’s another stron round-robin, but not nearly as strong as the Montreal event. Still, with an average rating of 2503 or so, it’s going to be a challenge. I’m the #8 seed of the 10 players by rating. With 1.0/3 and black against top seed GM Etienne Bacrot (2721 FIDE) in round 4, things were not looking great for my tournament. I had played Bacrot once before, a long time back in 1995 – that game did not go well for me (see https://vbhat.wordpress.com/2009/08/24/back-in-the-day/). 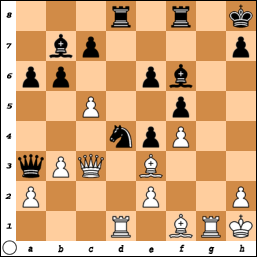 I knew I was better, and was thinking about 34…Nc3, which leads to a pawn-up endgame after best play from White. However, I also knew that I had lost two games and was losing to Akobian, so I figured I should get at least half a point on the board before I ended up with a bagel for the event. And so, I ended up taking the draw. Here’s what might have happened after 34…Nc3. If 35.Nbd6, then 35…Bxd6 36.Nxd6 Ne2+ 37.Kg2 Rc3 is crushing. Thus, 35.Nxc3 is forced, after which 35…Qxd4+ 36.Kg2 Qxc3 37.Qxc3 Bxc3 38.Rad1 is a likely continuation. Black is up a pawn (the doubled f-pawns) and has the bishop pair. It’s a clear advantage, but there is still some work to do to win the game. The next round, I had the white pieces against GM Sergei Tiviakov (2674 FIDE). This was maybe my best game of the event – I had some faster (and maybe cleaner) wins, but this was a big struggle where my opponent defended very well and made me really earn the full point. After something like 28.Qg4, White’s attack is not particularly threatening, and so Black can play 28…Ra8, winning the bishop on a6. Thus, 28.Nf6+! is correct. After 28…Kf8 (not 28…gxf6 29.Qxf6 Kh7 30.h5, when White’s attack is irresistible) 29.Nh7+ Kg8 30.Nf6+ (a little repetition to get closer to move 40) Kf8 31.Qh5!, White’s attack is probably winning. Unfortunately, with only about 2 minutes or so, this is more easily decided at home with a computer. After 31.Qh5! Qb4! 32.Re2! gxf6 33.exf6, Tiviakov came up with the very good 33…Rb8!. 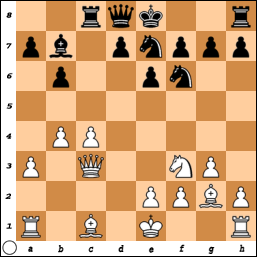 The rook guards the b5-pawn and isn’t as exposed as it would be on a8. 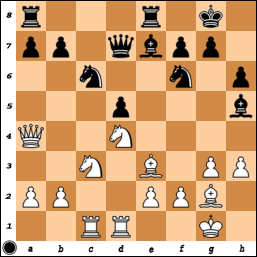 After 34.Bxh6+ Ke8 35.Rxe6+ Kd8, White doesn’t have 36.Qxd5+ because of 36…Rd7 and there is no rook hanging on a8! Thus, I had to retreat with 36.Re3, when there was still a lot more work to do to win the game. He played 61…a3, when it looks like Black is getting counterplay. White has two far-advanced pawns, but Black’s rooks seem to be watching them and Black’s a-pawn is getting close to queening as well. There is no mating net, so I played 62.f7 Rhf5 63.Qb8+ Ka5 64.h7, when a pawn is going to queen. The resulting Q vs. R (with my d-pawn versus his a-pawn) was a pretty easy win. 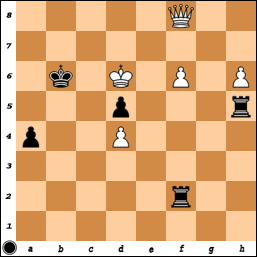 Here, Black has his sights set on f2, so I wanted to close the 2nd rank for White’s rooks. 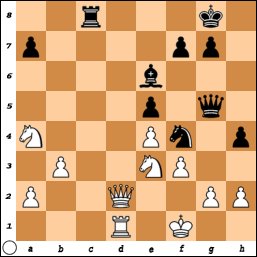 Thus, I played 24…g5!, and after 25.Bd2 Ng4, the pressure is unbearable for White. 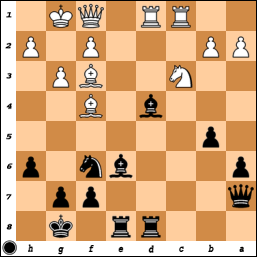 If 26.Bxg4 Bxg4 27.Re1, then 27…Bxf2+ 28.Qxf2 Qxf2+ 29.Kxf2 Rxd2+ wins for Black. He tried 26.Ne4, but after 26…Bf5 27.Bxg4 Bxg4 28.Re1 f5! 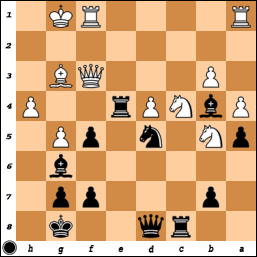 29.Nc3, the same tactic works for Black and he resigned soon after. Thus, going into the rest day, I had 3.0/6, a nice turnaround after my 0.5/3 start. Coming off the rest day, I had the white pieces against GM Sebastien Maze (2546 FIDE). The game was not a particularly exciting one, as neither of us took an undue risks and the game ended in a draw after about 25 moves. It’s a normal idea in the Stonewall for White to break Black’s strong points on d5 and f5 with f3 and e4, but here, that plan has worked to perfection. White has a mobile center with all his pieces nicely deployed while Black’s king is exposed and his development is lacking. It all ended quickly for Shulman after 15…Bb4 (not 15…Bc7 16.Nd5!) 16.a3 Bxc3? 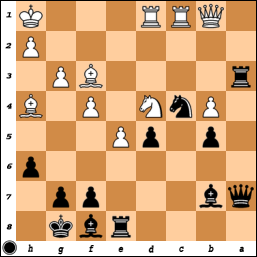 (16…Ba5 is better, but it’s still not good for Black) 17.Bxc3 a5 (otherwise 18.Bb4 would win an exchange) 18.d5!. The pawn sacrifice makes total sense since Black’s king is going to feel rather exposed and White’s development is better. After 18…Nxe5 19.Rae1 Nf7, I decided to go with 20.Nd4 (20.Nxf4 also wins) Qc5 21.Kh1 Bxh3 (desperation) 22.Nf3, and it’s all over for Black. He resigned a few moves later. I got back from Montreal a few days back (I spent some extra time there after the event), so it’s now high time to blog about the tournament. Going into the event, I knew it would be a struggle, as it was the strongest tournament I had ever played in. The average rating of the entire field was 2615 FIDE (or Category 15); however, as the lowest-rated at 2473 FIDE, my opposition had an average rating closer to 2630 FIDE (or Category 16). Up until this event, the strongest field I had ever faced was at the Qingdao Open in China in 2002. I was there to play an open event prior to the US-China Chess Summit Match, and I ended up making my first official GM norm with a +1 score against a field with an average rating of close to 2580 FIDE. The event saw me struggle at the start of the event, scraping only half a point out of my first three games. However, I then scored 4.5 points from my next 6 games before dropping the final two games to finish at -1 with 5.0/11. In the first round, I had white against GM Alexander Onischuk (2699 FIDE). I had never played (or met) Onischuk before this event, and to be honest, I was a little nervous before the game – it’s not normal for me to start out an event against such a strong player. In most open tournaments that I play in, I get a 2200 or so in the first round, and so I can more easily ease myself into the competition. Here, though, I was going to be facing one of the top dogs out of the gate. I had already gone wrong a little bit after being surprised, but I shouldn’t be worse here. However, I think I underestimated the danger and played 11.Be3. White wants to play 11.f3, hoping to force 11…exf3 12.exf3, when Black’s strong pawn on e4 disappears and the backward e6-pawn gets exposed. 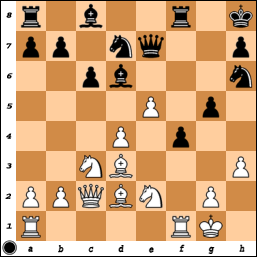 However, after 11.f3, Black has 11…Nc6 12.Be3 Bf6 13.d5 Na5, with a very good position. Because of this, I decided that if I guarded the d-pawn enough, I would get to play f3 later. Unfortunately, Onischuk never gave me a chance to do so under favorable circumstances. I played 24.Bxd4, when Onischuk played 24…Rxd4 (not 24…Bxd4 25.Rxd4, when Black’s king on h8 is toast) 25.Rxd4 bxc5 26.Rd8, and now Black has only one move to win, but win it does (and it’s not too hard to find). 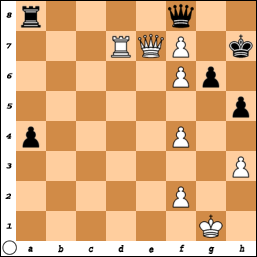 Both 26…Rxd8 27.Qxf6 and 26…Bxc3 27.Rxf8 win for White, so Black has to close the g-file with the intermediate 26…e3+, when 27.Bg2 Bxc3 28.Rxf8+ Kg7 wins for Black. (1) Although new, Akobian had done his homework well and looked at this exact piece sacrifice on his own! (2) And more concerning, it turns out to not be sound! Of course, I couldn’t know (1) beforehand, but I could have known (2) had I done my preparation more thoroughly. But, ignorance is bliss, and so I played these moves quickly. After Akobian continued to blitz out the moves 18.Bxg4 Nxg4+ 19.Ke1 Qxh2 20.Qe2 Rad8 21.Bg5 f6 22.Be3, I was quite worried, since I hadn’t expected him to have known about this line. However, after 22…h5, he sank into deep thought for almost 50 minutes. During his long think, I spent some time watching the other boards, but I also spent some time sitting in the viewing chairs watching our board on the projection screen. It was during this time that I realized that I not only couldn’t remember what to do against 23.Qf1, but I couldn’t find anything good to do either! After 23.Qf1, White covers the h1 square and prepares 24.Bf4, trapping the Black queen on h2. Retreating the queen isn’t a real option, but in this position with the insertion of Bg5/…f6/Be3 (rather than Be3 immediately), 23…Ba6 fails. Meanwhile, after 23…Nxe3 24.Nxe3 Qh4+ 25.Qf2 Qxe4 26.Nc5 Qe7 27.Nxb7 Qxb7, White has beaten back the attack and has a knight for 3 not so great pawns. White is clearly better. Luckily for me, even after his long think, Akobian played the computer’s first choice with 23.Kf1. Against this, I did know what to do, and the game ended in a draw shortly afterwards. A couple days later, Akobian told me that his analysis file had 23.Qf1 in it, but he simply couldn’t remember it at the board and wasn’t able to find it during his think either. Phew – one bullet dodged! 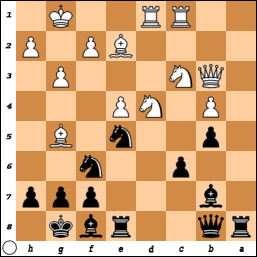 Black is obviously threatening various things along the c-file, but after a long think, I came up with the incomprehensible 12.Bb2?. I had seen, and planned, the correct 12.Bg5, and while White is not better after that, he at least isn’t really worse either. But after 12.Bb2?, I just lose a pawn to 12…Bd5 13.c5 d6, and I can’t guard the c-pawn enough times. Amazing. Down a pawn, I dug in my heels and defended like a wounded lion (I think) for another 80+ moves before finally succumbing to the inevitable. Last I blogged, I had 3.0/5 in the Quebec Invitational with 4 games to go. In round 6, I had the white pieces against Francois Leveille. As Dana Mackenzie noted in the comments to the previous post, Francois had won a game with quadrupled f-pawns against the American IM Jay Bonin in the 1990s! I hadn’t noticed this game in my preparation for him, as I was playing him with the white pieces, but it’s pretty amazing to get quadrupled pawns in one game. I can’t remember ever having it, even in a casual game! There are a few tactical motifs to notice here. The first is that the queen on d7 is only guarded by the knight on f6, so if the knight leaves, then White’s queen will be pinning the knight on c6. The other is that the queen and bishop on h5 can potentially both be hit from the d5-square. This motivates the following combination starting with 16.Nxd5!. 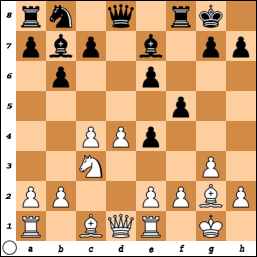 If now 16…Nxd5, 17.Nxc6 bxc6 18.Rxd5 hits queen and bishop; the pawn on c6 can’t capture the rook because the queen on d7 is now hanging, while the queen can’t find a square that is safe and guards the bishop on h5. Thus, Black loses a piece. That bumped me up to 4.0/6 and in the next round, I had the black pieces against GM Anton Kovalyov. He was born in Ukraine, then grew up in Argentina, before moving to Montreal a couple years ago. At only 17 years and 2571 FIDE, he is clearly quite talented. I was a little bit worse after the opening, but thanks to some precise defense and tactical shots, I managed to equalize and accepted his peace offering. I now had 4.5/7. In round 8, I had the white pieces against the lowest rated player in the tournament, Ling Feng Ye. He had won a qualifying tournament the day before the Quebec Invitational started to get the last spot in the event! I got some advantage after the opening, then threw it away and had to work hard to get an advantage back. I didn’t let the advantage go a second time, though, and the win pushed me up to 5.5/8. With Roussel-Roozmon’s win over Sambuev, this meant that I was guaranteed a top-4 finish and one of the qualification spots in the prestigious Montreal International. However, Roussel-Roozmon could still catch me with a win in the last round, so I definitely had something to play for. Now I dropped the hammer on him with 31…Rxf3!. After 32.Nxf3 d4!, the bishop on b7 is alive and kicking. Mark played 33.Rf1, but after 33…Qa3, he threw in the towel. There’s no good way to defend the knight on f3. For example, 34.Kg2 allows 34…Nd2, with a very strong fork. That win brought me to 6.5/9 and clear third place in the event. Kovalyov won his last game to move up to 7.5, while Mark was in second with 7.0. Roussel-Roozmon got the last qualification spot with 5.5. The Montreal International begins at the end of August and features an all-star cast headed by French super-GM Etienne Bacrot (2728 FIDE!). The average rating of the 8 seeded players (not those of us who qualified) is 2664 FIDE, which makes it a category 17 event! With us included, it drops to a category 15 event. The website for that event is at: http://www.echecsmontreal.ca/. As for me, the chess continues with the World Open in Philadelphia. I’m in the 7-day schedule which started tonight – I drew against GM Vladimir Potkin (2621 FIDE, 2721 USCF). It’s been a long time since I played up in the first round of a swiss tournament!